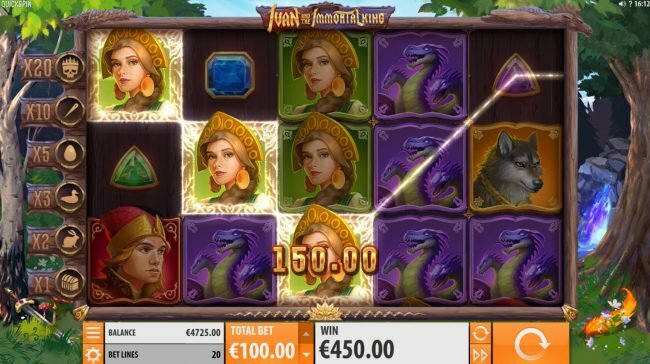 Ivan and the Immortal King Slots has not been reviewed yet, be the first to rate this slot. When we create a slot such as Ivan and the Immortal King, we take into consideration many things. Mainly we show that the Slot Machine has 20 lines as well as 5 game reels. 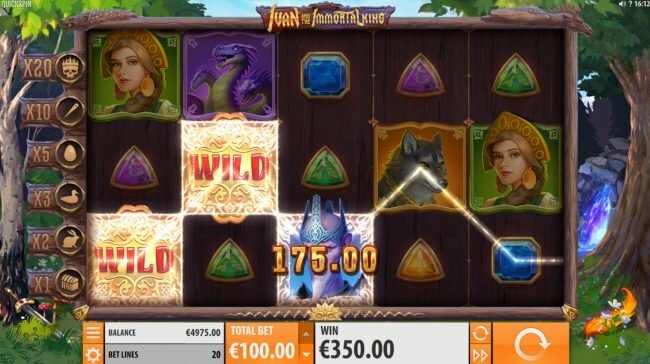 This Slovak folk hero themed video slot delivers more than you would think of game play by featuring graphics such as Ivan, king, woamn, wolf and tree-headed dragon. 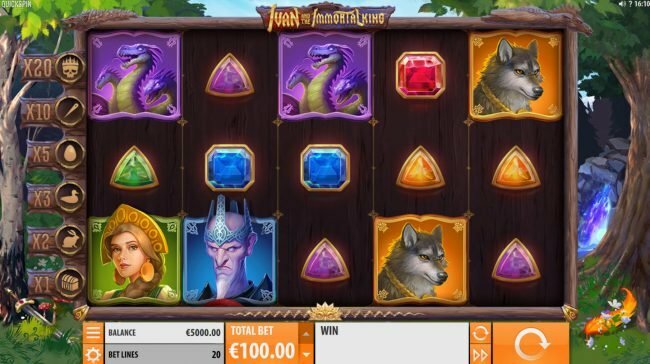 Along with these Ivan and the Immortal King has red, blue, green, yellow and purple gemstones that delivers the final touch of this decent Slovak folk hero online video slot machine. 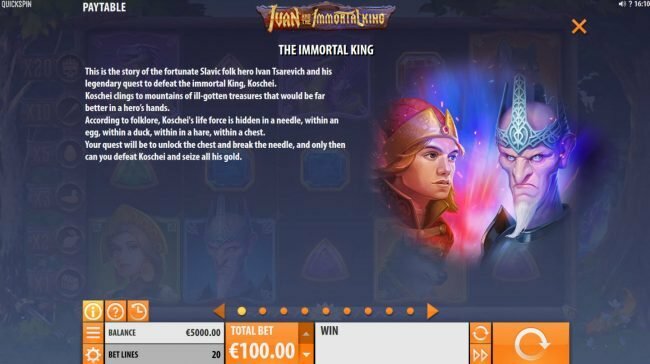 Deciding on a wager size for Ivan and the Immortal King is easy, allowing an initial small wager of $0.01 all the way to $100, this allows you to play at your preferred level. 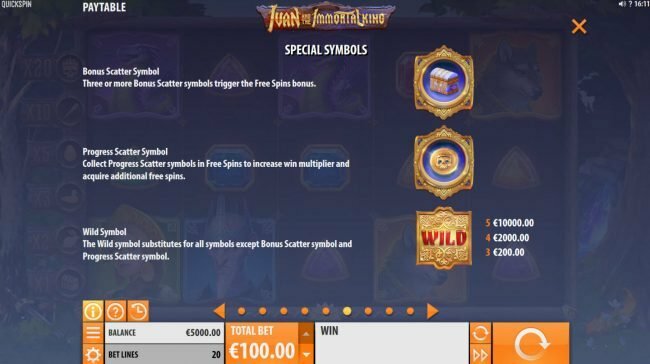 The wild wild symbol can substitutes for the values of all symbols excluding the Bonus chest and skull progression scatter, increasing your chances of wining a decent amount. Notice the scatter icon seen on Ivan and the Immortal King the bonus chest and skull progression scatter, these symbols pay out if you have multiples on the game. These special images do not need to be on the same payline to launch the win. When you know right away your pay lines are doomed there is still a good an ability of still winning with scatters. 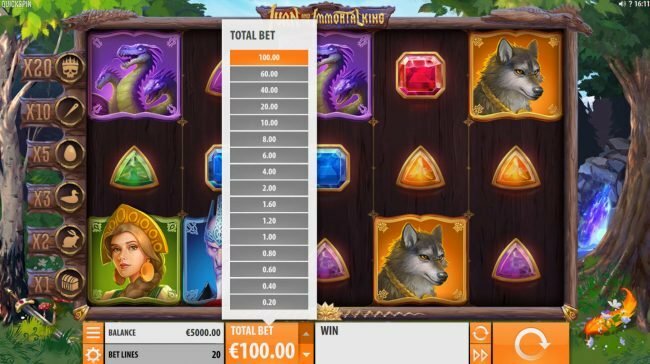 We suggest other Online Slot Machines like Pirates Charm as it has the 5 reels also, similar Slots including Ticket to the Stars and Hidden Valley are enjoyable also. 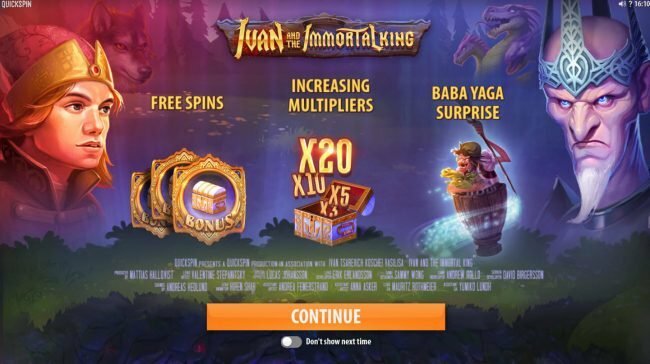 As a lot of Quickspin slot machines like Ivan and the Immortal King act the same so play some others as well. 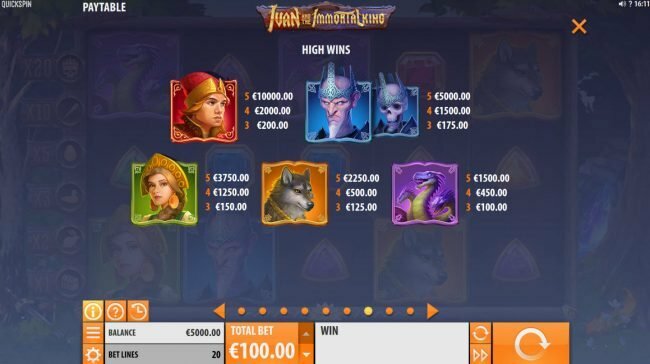 We really loved reviewing Ivan and the Immortal King, the Slovak folk hero based online slot offers some good amount of detail that sets you into that state of mind displaying the Ivan, king, woamn, wolf and tree-headed dragon symbols and graphics. 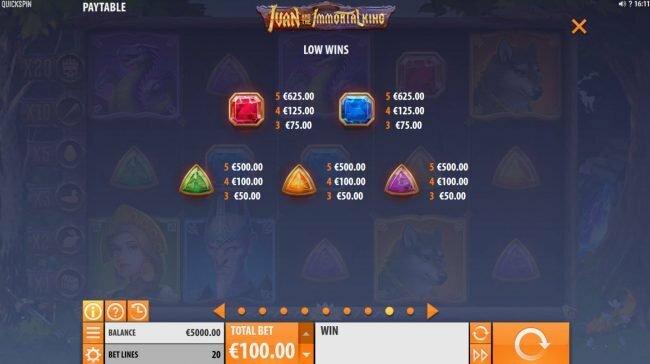 To wrap it up we think Ivan and the Immortal King was an entertaining game with above average pays and graphics. The Slot feature piece of Ivan and the Immortal King is really cool. Here are explanations on the Bonuses you can get. 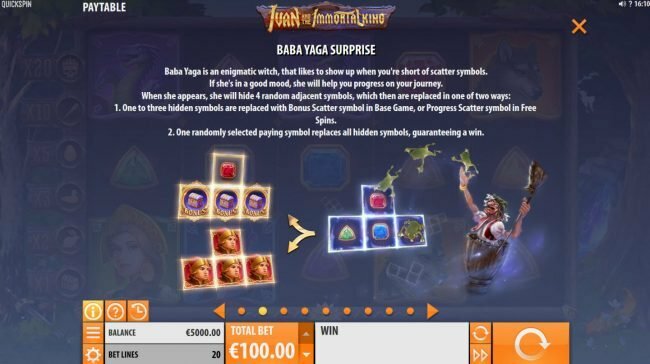 If you enjoy big piles of cash, the Baba Yage Surprise will not disappoint you. Simply get random chance to launch. By getting three or more bonus chest symbols the special bonus launches. 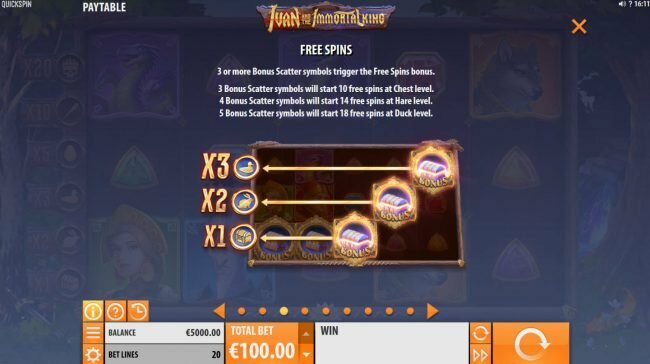 This Free Spins is an outstanding way to produce a large payout. If you appreciate big fat piles of credits, the Free Spins Level Progression will not let you down. 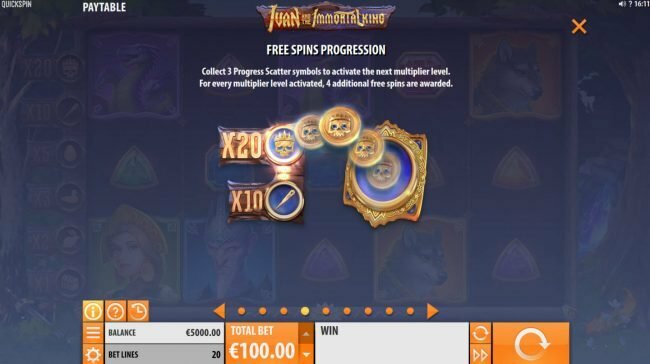 Simply get collectinb three scatter symbols during the Free Spins feature for a great win. I have to grant Ivan and the Immortal King 5 of 5 stars for the bonus games. you can be distracted from the game play.